Care for your hardwood floor and it will last many lifetimes. If you’ve read our article about taking care of your hardwood floors, you’re already pretty knowledgeable about the basic steps one should take in order to keep hardwood floors shiny and free of damage. If you’re taking most of the simple steps we’ve recommended, you’re on the right track toward preventing scuffs, scratches, dents, water stains and warps, ultimately setting yourself up to avoid expensive refinishing work down the road. But you may still have a few questions about properly cleaning your hardwood floors, and we’ve got answers. In this article, we’re going to walk you through it step by step. Let’s get to it! If there are loose, abrasive particles sitting on the surface of your wooden floor, it’s crucial to remove them before proceeding. Things like dirt, crumbs, dust and small rocks can scratch your floor, and you want to avoid pressing these things in and dragging them around over your finish. 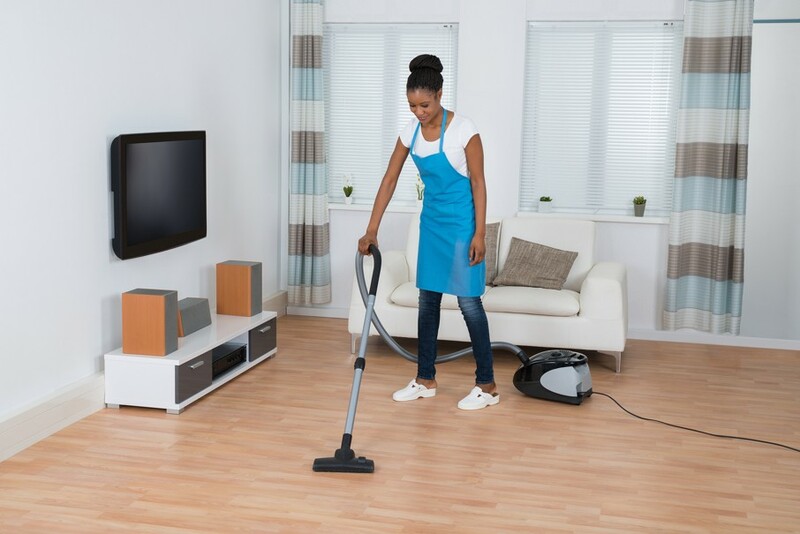 Grab a soft-bristle broom, or better yet, a padded hardwood floor vacuum and make sure that all debris, large and small, is removed before proceeding. Overall, your hardwood floors will suffer less general wear if you regularly scan for areas that your mop won’t easily clean. Any sticky or crusty build-up, smudges, stains or spots should be spot cleaned before mopping. Grab a soft cloth, and remember to use the minimum amount of moisture necessary to get the job done. That means you should dampen, not soak, your cloth in water, a diluted vinegar mixture or a safe, professional hardwood cleaner. Remember that water is a hardwood floor’s worst enemy. While it’s necessary for an effective cleaning, you should always use as little as possible and dry up the excess right away. 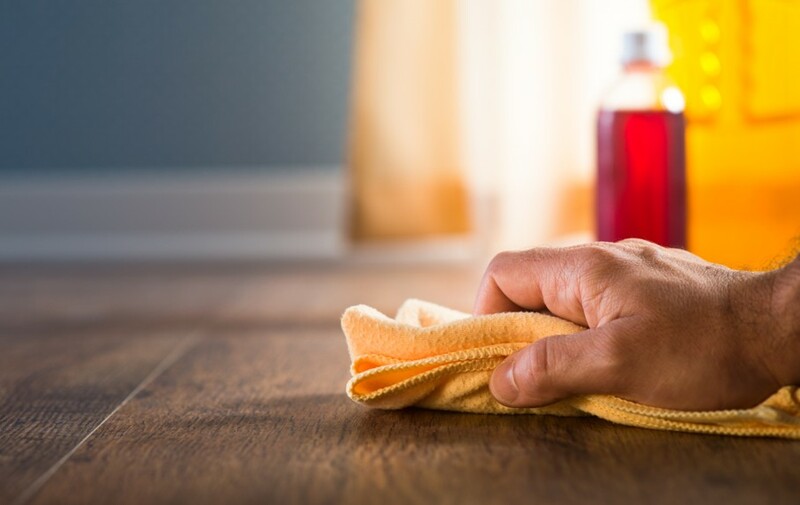 You may be accustomed to soaking tough spots when you do other cleaning around the house, but it’s never a good idea to soak areas of your hardwood floor. Once you’ve removed surface debris and done a quick spot check for spots that are tough to remove, you can proceed to washing the entire floor. 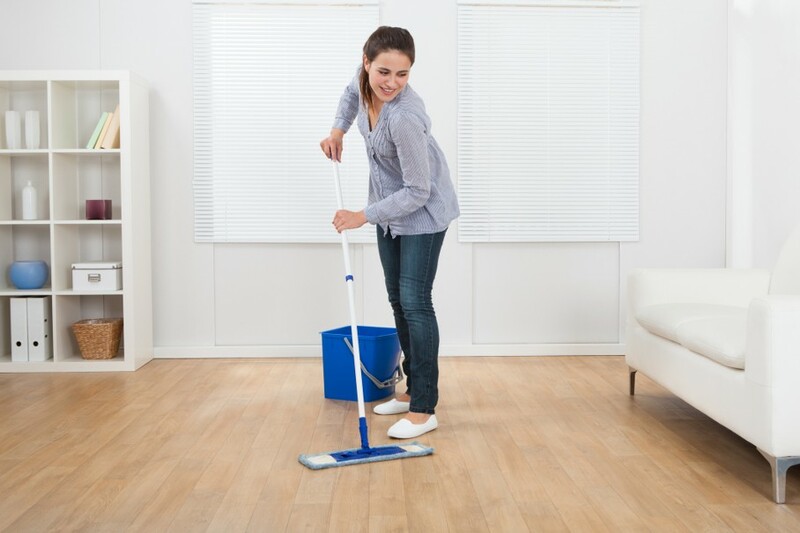 What you use to clean your floor depends on the type of hardwood floor you have. 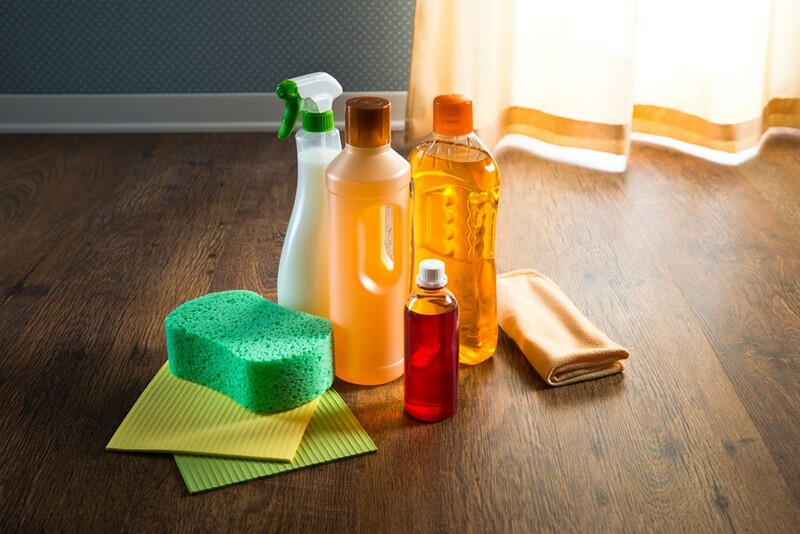 Many cleaning products that contain oil soap or wax claim to be “safe for wood floors,” but this can be misleading. You’re not cleaning wood – you’re cleaning the finish. And often, the warranty on your polyurethane finish can be voided by cleaning products like these. Make sure you research your particular finish, understand your warranty and only use a cleaner that’s approved for your particular floor. Choose either a soft cloth or a mop, and proceed to work on small areas using as little water as you can. Don’t soak your cleaning tool, just dampen it! It’s a good idea to go over the floor twice. The first time will loosen up and dissolve the dirt that’s clinging to your floor. After your first pass, thoroughly rinse and wring out your mop or cloth and go over the floor again to remove the dirt for good. While it’s okay to let a slightly damp floor air-dry, you never want to let water stand on your surface. Ultimately, if you want to prevent water spots, you might be better off just drying the floor with a soft, non-abrasive towel. If your mopping job hasn’t left your floor with quite the shine you were hoping for, consider a simple buffing job before you think about waxes or oils to restore your floor’s shine – buffing may do just the trick. If you still have questions about hardwood floor care, appropriate cleaners, or anything else, we’ll be covering more in additional articles. 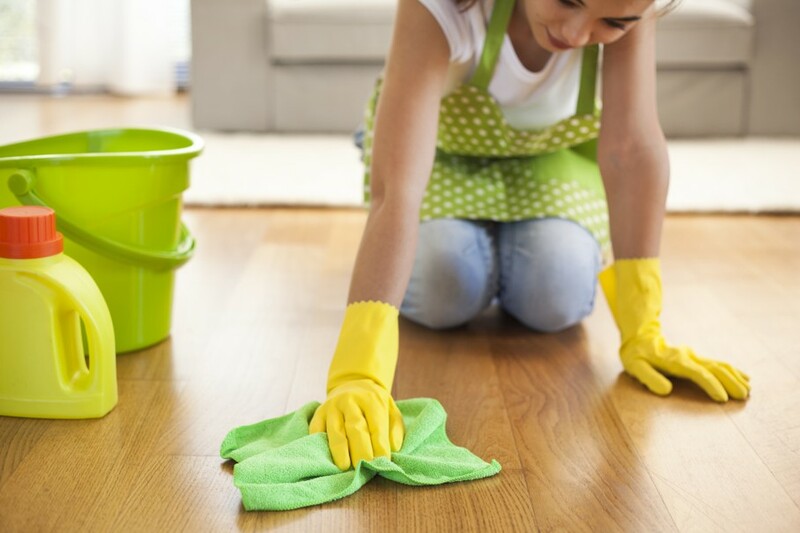 Have any tips of your own on cleaning a hardwood floor? Let us know in the comments below!